So I did it. I caved. I bought a pair of floral jeans, you guys. I have been super hesitant to give into the floral trend for a number of reasons, but primarily because my grandma (aka Graham Cracker) has always made it blatantly clear that her favorite "color" is floral. Which means I have stayed away from it for the most part. However, last week I found myself absolutely hypnotized by these last week while doing some major online shopping damage. It was shocking how much I loved them, and I had to have them. So I made them mine, assuming I would probably hate them and return them the minute they arrived at my door. BUT, upon trying them on, everything changed. I envisioned myself in them this weekend with a basic tee & a wedge or with a high-low blouse & pumps with a bold lip color for a night out with the girls. So I made it official - I ripped the tags off. 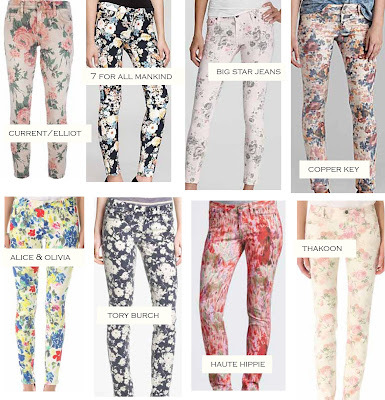 And that, ladies, is the story of how floral print jeans won me over. Here are some others that may or may not be next in my wardrobe..
Are you a fan of the floral print trend? I recently gave in to buying a pair of floral jeans as well! I resisted for a little while, but it didn't last! Ok Ill take one of each please!!! Don't let Graham Cracker see you in them! She'll be out buying an identical pair...stat! I like the Tory Burch ones above, and also the ones that Closet Fashionista posted about! 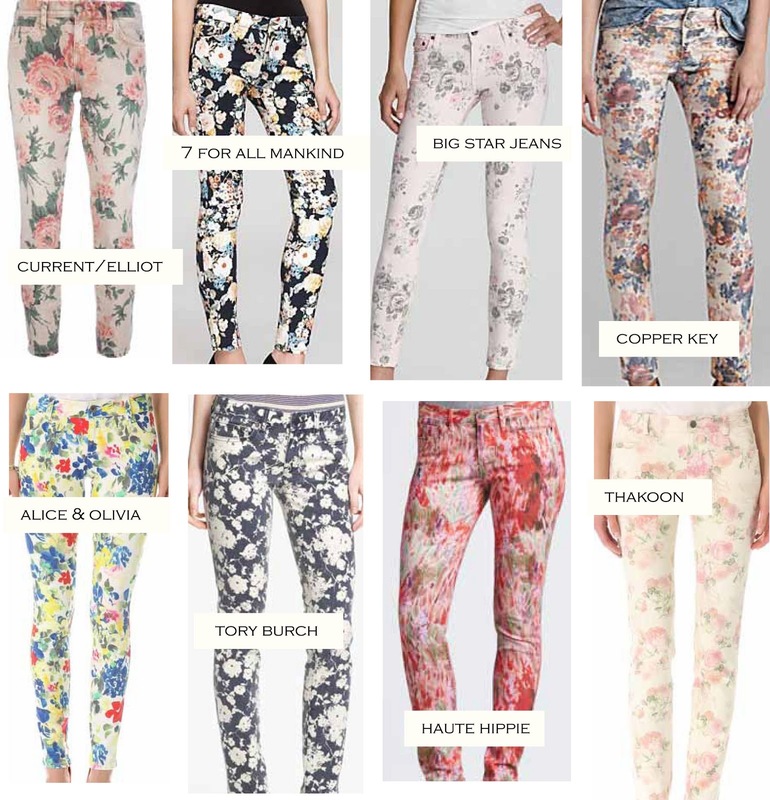 I had the greatest pair (not skinny jeans, though) of floral jeans when I was in high school/college...I guess what they say is true--styles come back around about every 20-30 years! You need to start posting a pic of YOU in your darling outfits, my dear! I am in love with the 7 For All Mankind Pair!!! Thanks for the comment, Niki! I know, aren't they just EVERYTHING?! Ha! I'm warming up to the idea Megan. I think it looks great on others...I have a pair that I should really wear more often! Yes to floral jeans. I've been obsessing over anything floral! hehe i loove them too! I love florals and I got a pair of floral pants. This alice + olivia pair is fantastic! really lovely seletion! love it! I LOVE this trend, I am doing a post about it soon! Hey, great post love :) I'm quite fussy when it comes to floral, but i like most floral jeans!